What an awesome buying experience! From the moment we stepped into the dealership were greeted with a smile and a enthusiasm. The atmosphere in your beautiful building is electric. Sales staff were the best I ever death with, you guys are to be commended to bring that kind of attitude to work every day. This was my first purchase at Clarenville Ford and I will definitely be back to buy my next vehicle. 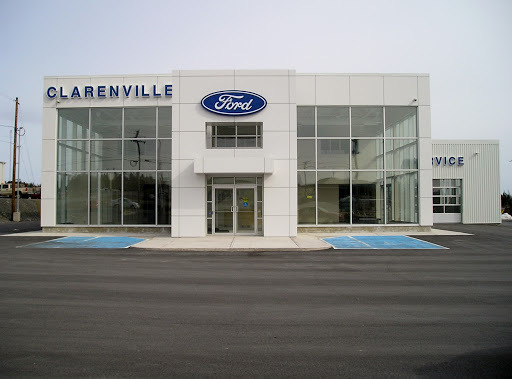 I recently had my vehicle in for service at Clarenville Ford Sales Limited. They were very friendly & professional in the way they made my visit enjoyable. They provided me with another vehicle while mine was being serviced professionally & completely. I am fully satisfied in the service I get from them & cant think of going to another dealer. Thanks Clarenville Ford. This is my second Ford F 150 from Clarenville Ford Sales Limited and both have been exceptional trucks. In addition I have received excellent service and the staff is always very helpful and professional. The staff at Clarenville Ford is very accommodating when you need service and will go above and beyond to be of assistance. This has been the best vehicle buying experience weve ever had. The staff has been courteous, friendly and very accommodating and are second to none. This has been a very happy and satisfying transaction and we can highly recommend Clarenville Ford Sales Limited. Awesome dealership, one of the best buying experiences I have ever had!!! Everyone is upbeat, energetic, happy and fantastic to deal with!!! I will definitely buy my next vehicle at Clarenville Ford and recommend to others. Service was fantastic.....always receive great service. Staff are friendly and courteous to me. I always recommend Ford to others when theyre thinking of buying a new vehicle. Totally good experience. Felt appreciated and quite satisfied with the whole process. I certainly recommend all the staff at Clarenville Ford. There were no issues. Very friendly and helpful service staff. Had a laugh. In and out in no time. Great service from the folks there very professional to deal with will be back again !! Excellent service. Professional, personal treatment of the customer. Awesome experience in sales. Staff are very friendly and helpful! We had great service and everything went smoothly.